20 oz kennel crock keeps the food off the floor of the kennel. Secure attachments prevent spills. 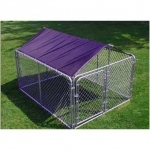 Ideal for pet carriers, holding pens, display cages and kennels. Constructed of durable and weather resistant high impact ABS plastic, this large heated pet mat is designed to automatically heat to your pet's body temperature range to keep them warm during the cold season. Constructed of durable and weather resistant high impact ABS plastic, this medium heated pet mat is designed to automatically heat to your pet's body temperature range to keep them warm during the cold season. Polyethylene cups feature built in hooks to clip onto the side of any type of wire animal cage. Galvanized cups feature built in hooks to clip onto the side of any type of wire animal cage. Constructed of durable and weather resistant high impact ABS plastic, this small heated pet mat is designed to automatically heat to your pet's body temperature range to keep them warm during the cold season. One quart stainless steel Snap'y Fit water and feed bowl. Patented bracket locks and holds durable stainless steel bowl in place. Allows for easy removal. Two quart stainless steel Snap'y Fit water and feed bowl. Patented bracket locks and holds durable stainless steel bowl in place. Allows for easy removal. Easy setup, requires only adjustable wrench. All hardware and instructions included for 15 minute installation. Durable 10 mil polyethylene solid cover provides protection from sun and rain. Frame work is high strength galvanized steel tubing. Kennel roof must be removed during high wind or frozen precipitation events. Disclaimer is provided.